The craziest football game of the week takes place when most of the East Coast is asleep. It's time to change that. WASHINGTON — Listen, we’re all adults, and adults have responsibilities. Maybe you have kids, or maybe you just have grown-up things to do that consume your Sunday mornings. But when it comes to pure, unhinged, fill-up-an-IV-and-put-this-straight-into-my-veins football entertainment, it’s really hard to beat staying up into the wee hours on Saturday night to watch #Pac12AfterDark. What exactly is #Pac12AfterDark? Formally, it’s the 10:30 p.m. ET kickoff game televised nationally on ESPN during the college football season, featuring one or more teams from the Pac-12 Conference. Practically, it is something far more twisted. “I don’t care about Pac-12 football,” I hear some of you saying. That’s totally understandable and also totally beside the point. #Pac12AfterDark isn’t really football, as those of us who have subjected ourselves to after-2 a.m.-bedtimes for years will attest. It’s an alternate reality in which the history and traditions and rules of football are to be laughed at as they are discarded for something not necessarily better, but indisputably weirder. 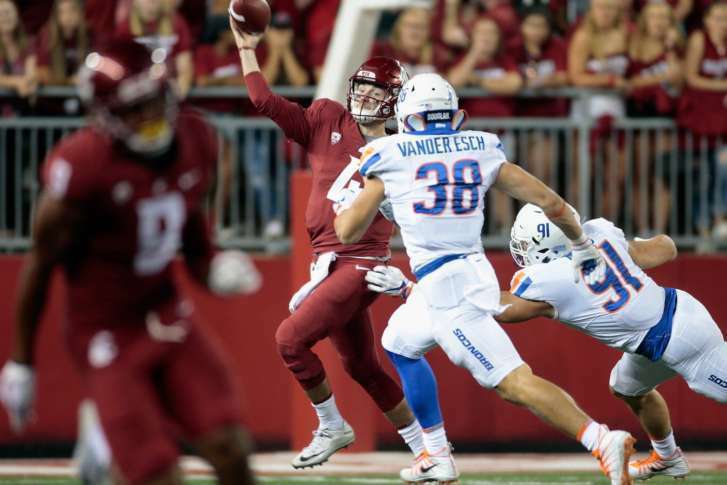 Last week, most of the nation put its Saturday football-watching to bed with Boise State having scooped-and-scored a 55-yard fumble return to take a 31-10 fourth-quarter lead over #24 Washington State in Pullman. Washington State’s record-setting, NFL prospect quarterback had been benched. The game was easily over, except that of course it was a #Pac12AfterDark special. After backup quarterback Tyler Hilinski led a 75-yard touchdown drive to cut the deficit to 14 with eight minutes to play, the true #Pac12AfterDark began to assert itself. Yes, that was an attempted shovel pass — the pass that is much safer than a lateral, because it can really only result in a turnover if you shovel it, say, directly to an oncoming defender. After forcing a Boise State punt, the Cougars stalled out and, facing a 4th-and-20, had to punt the ball away with just 2:51 to play, still down a touchdown. So of course that punt bounced off the back of a return team blocker, with Washington State recovering, then scoring the game-tying touchdown, forcing overtime. And of course the game went three overtimes, ending on a wild, walk-off touchdown by Washington State after the Broncos had settled for three points on their possession. While it wasn’t officially #Pac12AfterDark, UCLA set the tone for the conference’s late night absurdity with its stunning Week 1 comeback from down 44-10, scoring the final 35 points to shock Texas A&M. And now, this weekend, we have the promise of a truly weird installment: Cal vs. Ole Miss. Unless you’re a fan of either team, it’s hard to truly convey what a perfect blend of madness this might create. Ole Miss is just the perfect level of unpredictable, middle-tier power five team to be sucked into the perennial vortex of madness that Cal routinely creates. Cal’s defense is slightly better than last year’s unmitigated disaster. Ole Miss’s is…also bad. This is bad for the members of those defenses and their coaches, but good for the rest of us, who need points as reward for our self-induced insomnia. Both teams have overcome somewhat sluggish starts in each of their first two games, but each are 2-0. The Rebels have beaten up on South Alabama and Tennessee-Martin, not exactly powerhouses, so it’s hard to say how good they really are. But with head coach Hugh Freeze fired for a ridiculous scandal right before the beginning of the season and the NCAA hearing beginning this week, it’s a strange time for the program. Cal, meanwhile, was picked to finish last in the Pac-12 North, but snagged a nice season-opening road win as a double-digit underdog at North Carolina before surviving a test from FCS foe Weber State. The line favors Ole Miss by 3.5 points — the Rebels haven’t covered yet this year. It may not be a particularly well-played game, but it should be a close one. Given the cloud around Ole Miss, you may find yourself deciding to cheer for Cal. As a lifelong Cal fan, I can only warn you now that it is a dreadful decision on your part to invest any emotional capital in the Bears’ success. If you do, they will surely destroy your soul, by coming up short on a final drive, or giving up a game-winning touchdown in overtime, or allowing 36 fourth-quarter points, including a Hail Mary at the buzzer. Even your wins will be suspect, coming on such undeserved fortune as a missed 19-yard field goal or, even, a missed extra point. Do not invest in Cal. Don’t do it. You have been warned. Last year, I was in Minnesota for the week of the Cal-Texas rematch. Watching with a non-football fan, we had to sit through the remnants of a truly terrible SEC slog, and I could see he was worried about the prospect of sitting through another three-and-a-half hour late night snoozefest. I assured him this game would be different, and that while I couldn’t promise anything positive from the outcome, the first team to 50 points would win. Huzzah. The point is, don’t worry about picking a side. Just make sure you get a nap in on Saturday so you’re ready to go for that 10:30 p.m. ET kickoff. Remember: You aren’t tuning in for football — you’re doing it for the kind of unbridled chaos that only #Pac12AfterDark can offer. I can’t guarantee you it will be worth it. But it will be worth it.